I’m not paying much attention to our money these days, so I guess I shouldn’t be too surprised that we’ve spent way more than usual. There has been a bit of waste and convenience spending, but most everything was reasonable. I was just a bit taken aback in tallying it all up that it came out so high. 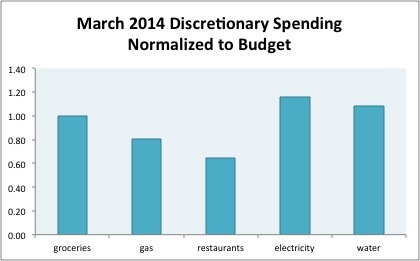 We were over in almost all of our variable spending categories. Targeted spending was a little weird – medium-sized purchases in a bunch of categories, plus we’re paying the expenses up front for a conference Kyle is attending in July. INCOME: Our normal stipend paychecks. Groceries: Ugh, over again here, even though I’ve stopped even counting our CSA spending. Just a lack of self-control. 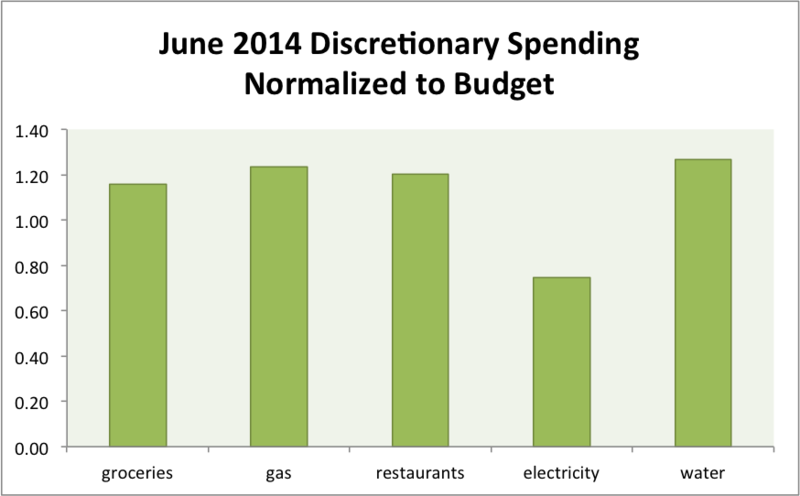 Plus it’s summer, which is always higher-spending. Gas: We filled up three times this month – Kyle was driving all over RDU trying to buy his electronics and we also went to a wedding 90 minutes away. So a reasonable overage, but an overage nonetheless. Restaurants: About 20% over on eating out. Unfortunately, only a bit of the spending was for legitimate social occasions and the rest was just convenience spending, which we try to avoid. Electricity and Gas: Lovely spring weather here meant we were under budget. Water: Quite over here and I’m not sure why. It’s about a 30% jump over our average. We spent $14.40 on some random stuff from Amazon. We bought a Kindle book for $9.15. I really can’t remember the last time we bought a book because we use the library for everything (or forgo it if the library doesn’t have it). We’re reading When Helping Hurts: How to Alleviate Poverty Without Hurting the Poor . . . and Yourself with our church small group this summer, so we can’t depend on a library loan for that whole period, and they don’t have an ebook version available. I hope it’s worth it! Kyle received another cash graduation gift. We spent $1,184.98 out of these accounts and transferred $207.09 in above our normal savings rates. We spent $78.99 on a wedding gift. We pulled $734 from this account to cover a flight and conference registration for Kyle. It will be reimbursed. We spent $96.10 on tickets to see the NC Symphony play John Williams music. We spent $107 on some clothes for me. We bought an iPad case , a Bluetooth keyboard, a new desktop keyboard, and a USB stick for $144.19. We spent $19.70 on prescriptions and received a $100 rebate from our health insurance for the glasses I bought last month. We gave $5 to the same homeless guy we’ve been giving to occasionally. We received our state tax return of $107.09. We actually need to re-file because we found something else to deduct. This was Kyle’s very last month being paid as a graduate student; next month he’ll be bringing in the big postdoc bucks! We decided on one budget change that will take effect in August – we’re supporting another missionary at $50/month. Major fail this month, unsurprisingly. We were over by $88.76, which we covered out of our general savings account. When you stop paying attention to your money, do you spend more or less? 6 Responses to "June 2014 Month in Review: Money"
I think you’re doing pretty darn awesome, especially considering how one-track you probably are right now. Just think, you’re $89 over, but imagine how bad it would/could be if you two weren’t so on top of your finances before thesis-ing! 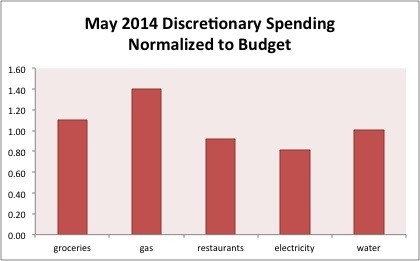 Alicia @ Financial Diffraction recently posted..Financial Update: June 2014. Good point. That does make me feel better. Things could easily be WILD! Good job. I spend a lot on dining too. i try to have a coupon for every time I eat out at a restaurant. And gas coupons too. What’s a gas coupon?? We use our grocery store membership to get gas rewards but that’s it. Out of sight out of mind. Anytime I’ve let my focus drift our spending has increased. I was thinking that sometimes when I get too busy I don’t have the time to spend money, but that’s not that case for us right now!